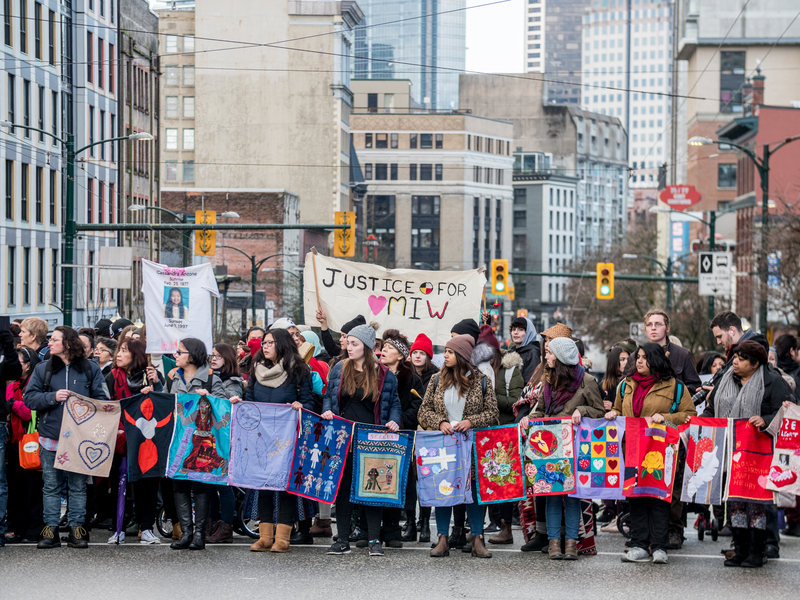 Hundreds of people participated in this year’s annual February 14 Women’s Memorial March to commemorate missing and murdered Indigenous women from Vancouver’s Downtown Eastside (DTES). 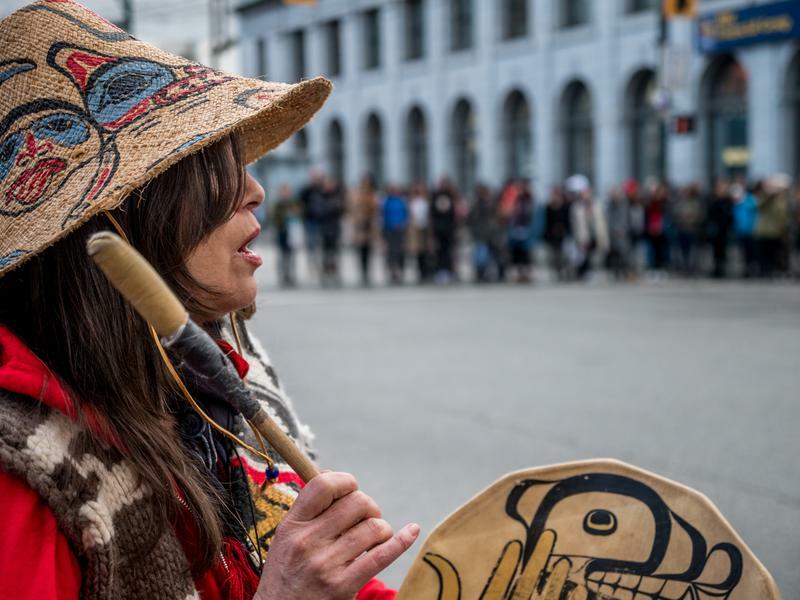 First held in 1992, the march started as a response to the murder of a Coast Salish women on Powell Street and has since expanded to many other communities across Canada. According to a study by Statistics Canada, Indigenous people are seven times more likely to be the victim of a homicide than non-Indigenous people. The RCMP estimated that around 1,200 Indigenous women have been murdered or gone missing in Canada between 1980 to 2012 — but activists suggest that the actual number could be as high as 4,000. Family members of missing and murdered women gathered in the Carnegie Community Centre for a private ceremony of remembrance before joining the larger public outside at Main and Hastings. The crowd formed a circle as they walked out of the hall, while some volunteers held quilts that honoured individual missing and murdered women. “It has been a very hard week for First Nations people on Turtle Island,” said one of the introductory speakers, likely referencing the recent acquittal of Gerald Stanley — a white Saskatchewan farmer — who was charged with second-degree murder of Colten Boushie, a young Indigenous man. 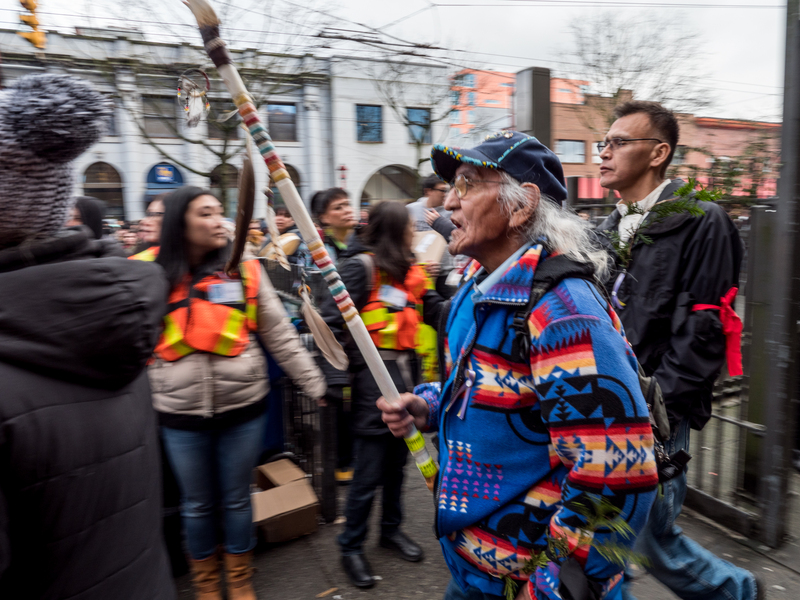 The crowd then marched through Gastown and the DTES, frequently stopping to perform honorary ceremonies where women were last seen or found. The march was led by Indigenous women drumming and chanting the Women’s Warrior song, which commemorates women who are no longer here. Many of them also stopped to give speeches when the crowd passed by Main and Hastings again. The first speaker discussed the importance of respecting one another and remembering those who have passed, but others gave more critical speeches. One woman then spoke about the overrepresentation of Indigenous children in Canada’s child welfare system, while another criticized the police over their inaction towards the murder of her sister. 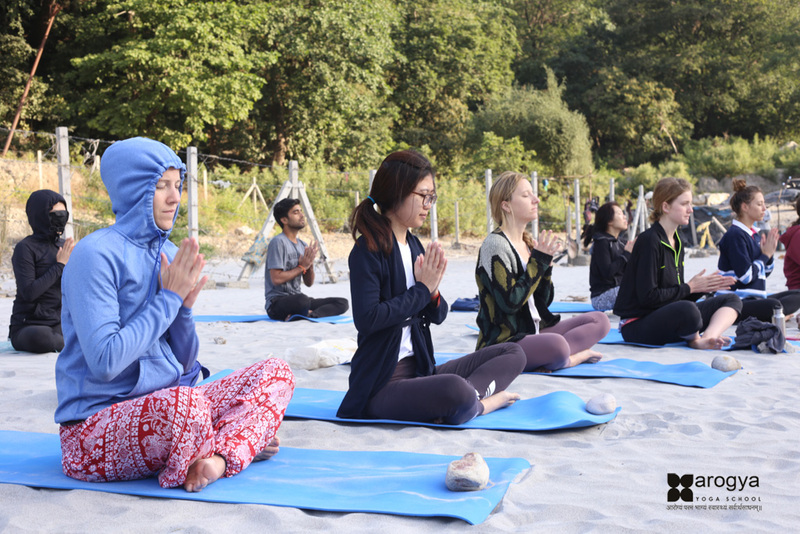 A healing circle was formed at Oppenheimer Park before the event concluded with a feast at the Japanese Language Hall. The march also featured a UBC presence from the First Nations and Indigenous Studies (FNIS) Student Association, who organized a group meet-up to attend the march. Two students who attended are FNIS Student Association President Alexa McPhee and Sarah Sitka, the editor-in-chief of the Journal of First Peoples Writing. “The Women’s Memorial March is a huge act of radical love for Indigenous women,” said McPhee, who is of mixed Japanese and Mi’kmaw origin. Both McPhee and Siska said violence against Indigenous women flourishes because Canadian society doesn’t see the humanity in them. 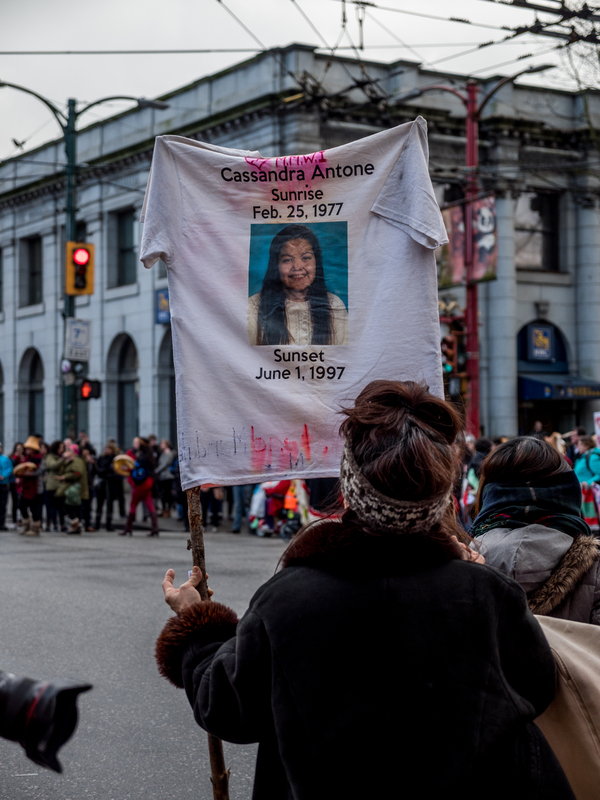 “Looking at the history of violence against Indigenous women, in the DTES specifically, Vancouver as a whole hasn’t cared about them [or] valued them as human beings because they were only seeing these women through racist and sexist lenses,” said Siska in a message to The Ubyssey. “The fact that it’s associated with Indigenous bodies makes it less of an issue in the greater public because Indigenous women are not seen as humans,” she said, while arguing that it’s because of this perspective that so little action has been taken over the issue. And while she acknowledged the establishment of the National Inquiry into Missing and Murdered Indigenous Women and Girls, McPhee was hesitant to embrace the inquiry because it takes a top-down approach in exploring the issue. “I don’t think the government’s necessarily able to address the root causes of missing and murdered Indigenous women as an epidemic — which would be like things like white supremacy, racism, violent colonialism, sexism [and] hetero-patriarchy,” she said.